Slovenian CBRN specialists decontaminate a Cobra Reconnaissance vehicle. An M1A1 Abrams MBT with 2nd Tank Battalion, 2nd Marine Division engages a target during semi-annual qualifications. The British LPPV Foxhound providing over watch security for the ANAOA, Afghan National Army Officier Academy, 10-year graduation ceremony. The HIMARS firing from the amphibious transport dock ship USS Anchorage during Dawn Blitz 2017 exercise. 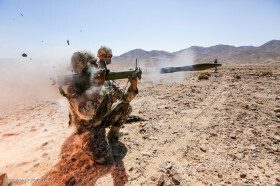 A Stryker ICV-D fires 30 mm rounds during a live-fire demonstration with 2nd Cavalry Regiment.